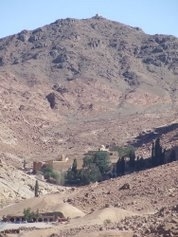 St Catherine's Monastery, which is located at the foot of Mount Sinai (also called Mount Horeb or Jebel Musa meaning “Mountain of Moses”) is built around what is thought to be the site where Moses spoke to God for the first time at the burning bush, although there is no evidence that it is the mountain referred to in the Bible. The monastery contains a Basilica, Chapel, Charnel House, Well, Library, Gallery and Mosque which are surrounded by a granite wall measuring 8 to 35 metres high. This wall defended it from numerous attacks in the 1,400 years it has been standing. It belongs to the Greek Orthodox Church and most of its monks are of Greek origin. For a desciption of the monastery buildings see Monastery Layout. as it is thought to be that site of the burning bush and the place where Moses recieved the ten commandments. It is also home to a unique collection of artifacts, including some of the world's oldest Bibles. I also believe it is very lucky to have had the help of Emperor Justinian, who built the defensive walls that have helped save the monastery from numerous attacks. Although it is set in a desert-like landscape, the lush gardens and cypresses provide a pleasant contrast. 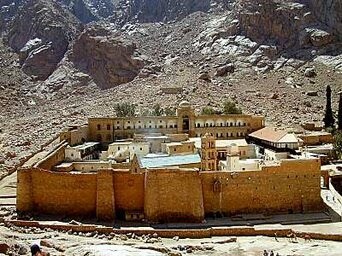 Today, it is one of the oldest monasteries in the world, it's preserved state and the fact that it is still operational after so many years, making it unmatched in the world.